With a broken wind sensor the only problem of any note aboard the Curiosity Mars rover, engineers planned to uplink commands overnight for an initial test drive, a short 10-foot move and a turning reverse maneuver to check out the robotic science lab's ability to roam its Gale Crater landing site, project managers said Tuesday. In two major milestones, engineers successfully tested the six-wheeled rover's steering system, commanding the four corner wheels to turn in place, and erected the lab's complex 7-foot-long robot arm and tool turret to test the appendage's drive motors and joints. 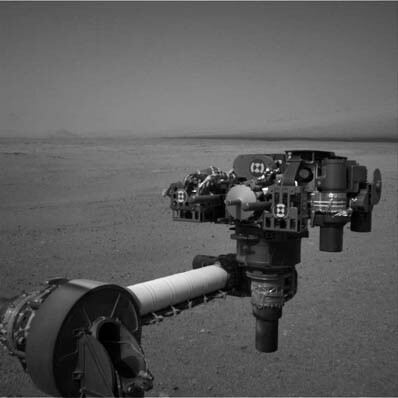 "The Curiosity rover and the ops team continue to hit home runs here," Mission Manager Mike Watkins told reporters. "We're in the middle of a really fantastic week. We have a pretty aggressive plan this week to do a lot more first-time science activities, as well as some critical engineering checkouts. I'm happy to say we've gotten through all of those successfully and on schedule." The steering test was carried out on Monday, two week's after Curiosity's landing in Gale Crater. 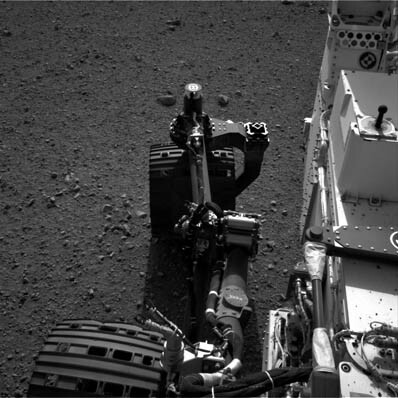 Animated GIF images posted on the Curiosity web page showed one of the back wheels turning left and right in a so-called "wheel wiggle." "Everything's in fine shape and that means we're go for our first test drive tomorrow," Watkins said. "Everything looks go for that right now." The rover first will drive about 10 feet straight ahead, stop, turn its wheels to the right and then back up in a 90-degree turn. The idea is to back up into an area that has already been photographed, one with no known hazards. "The other thing we did the day before was our first test of robotic arm," Watkins said. "So we unstowed the robotic arm and took a look at the tools on the end of the arm. It's kind of a Swiss army knife there where we have a lot of instruments. ... We wanted to make sure all of that was working by doing these first motor checks, and all of that went successfully." Images of the deployed arm were especially rewarding to the engineering team, Watkins said, because "we have looked at images like this so many thousands of times in our test environment and I always see the walls of the test lab there (in the background). Now to see the arm out there deployed with Mars out there in the background is just a great feeling." Arm engineer Louise Jandura said it will take several weeks for the team to calibrate the arm's motions, to fine-tune the joint motors for the lower gravity on Mars and to fully check out and calibrate the instruments in the 73-pound tool turret on its end. "The arm has already performed all these motions on Earth, but in a different gravity condition and that gravity does matter," she said. "Our turret at the end of the arm weighs as much as a small child and the differences in gravity change the amount of sag at the end of the arm. "So as we want to go interact with targets in our environment and with the rover, we want to be able to fine tune these end-point positions. So it will take some time to put the arm through all its paces." The arm is critical to the rover's science mission. The tool turret carries the equivalent of a geologist's hand lens, a sophisticated spectrometer, a sample scoop, a power drill and a dust removal tool. 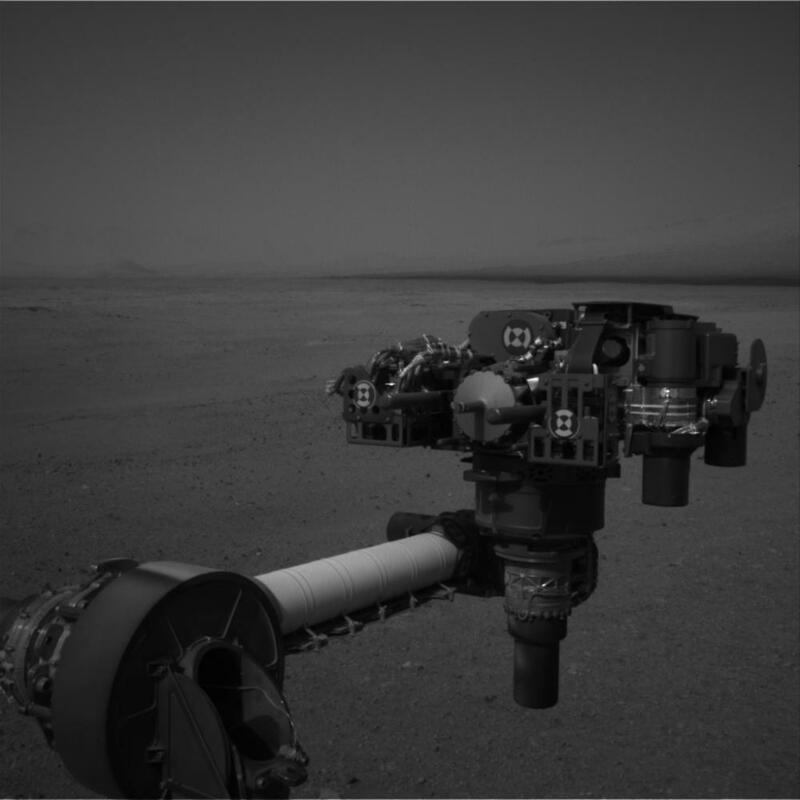 The percussive drill is capable of boring two inches into targeted rocks, collecting rock and powder for analysis by two instruments inside the rover's body. "Curiosity uses the arm to maneuver all the instruments, the tools, at the end in much the same way we use our human arm to control tools in our hand," Jandura said. "And these tools allow us to get a closer look using the camera and the spectrometer at the end of the arm and to also pick up samples with our scoop, to acquire powered rocks with the drill and to process them ... inside the rover." The only problem of any significance so far in Curiosity's checkout is the apparent failure of a wind sensor, one of two on short booms that extend out from the side of the rover's main camera mast. Engineers say the sensitive sensor may have been damaged during landing when Curiosity's sky crane descent engines kicked up dusty debris from the surface. "We don't think the rover was blasted by particles from the ground, we don't see any evidence the descent plumes impinged upon the rover or even blasted rocks toward the rover," Watkins said. "But it does appear that some small rocks became lofted in the winds that were generated by the plumes during landing and probably just fell upon the rover deck. "Now, putting two and two together you could come up with an idea that some of these rocks may have fallen on these exposed circuit boards and damaged the wires. That's just one potential cause. We don't know for sure and we don't really have a way of assessing that at this point any further." The other wind sensor on the second boom is fully operational and the Rover Environmental Monitoring Station -- REMS -- team is working "pretty hard to understand how to use that remaining, fully operational boom, to best derive wind speed and direction," Watkins said. Otherwise, the weather station aboard Curiosity is operating flawlessly, capturing data on atmospheric pressure, temperature, humidity and other factors. For the curious, the air temperature at the rover's landing site ranges from a high of around 37 degrees Fahrenheit to an overnight low of minus 131 degrees. After the rover's instruments and mechanical systems are fully checked out and calibrated, Curiosity will be commanded to begin a short drive to a nearby target of interest known as Glenelg, where three different types of geology are visible from orbit. Engineers hope that eventually Curiosity will be able to cover about a football field per day, comparable to the progress achieved by NASA's older, and much less scientifically capable, Opportunity rover. But that's a pace that will take many weeks to achieve. "Ultimately when we get everything fully checked out and we have our autonav and all of that working, I think there's a good chance we can drive the kind of distances that Opportunity has been driving, over a hundred meters in a sol (martian day) is kind of our goal," Watkins said. "But it'll take us a little while to get up to that rate. So this first set of drives, not just the little test drive tomorrow but actually the drive to Glenelg, we'll probably do that in small chunks just to evaluate what's going on. My guess is those are going to go in 10- to 20-meter chunks. But eventually, we'll get up to over a hundred meters a day."